This map is from 1900. Click to enlarge. Recently I learned that my mother’s mother, whose maiden name was Cora Esther Peirce, was born in a place called Breland, Louisiana. In fact, when Cora was born in May 1891, the U.S. post office for Breland was located on the property of her grandfather, John Ticknor Peirce, and her grandfather’s second wife, Salissa E. “Dora” Peirce, was the U.S. postmaster for Breland. Cora’s father, Adolphus Elliot Peirce, was later appointed U.S. postmaster for Breland, in August 1904. According to family lore, Cora worked in that post office before her family moved to the nearby community of Sunny Hill in 1905, when she was 14 years old. When she began attending school in Sunny Hill, Cora was assigned to the same class as Robert Milton Breland, my grandfather, whom she married in Baton Rouge five years later. This railroad map is from 1914. Click to enlarge. This story is interesting to me for several reasons. First, Cora was born in a place called Breland. Then she moved away from there to Sunny Hill — where she met a boy named Breland, who later became her husband. It also raises these questions for me: Where was Breland? Why was it called Breland? And, does the community of Breland still exist? 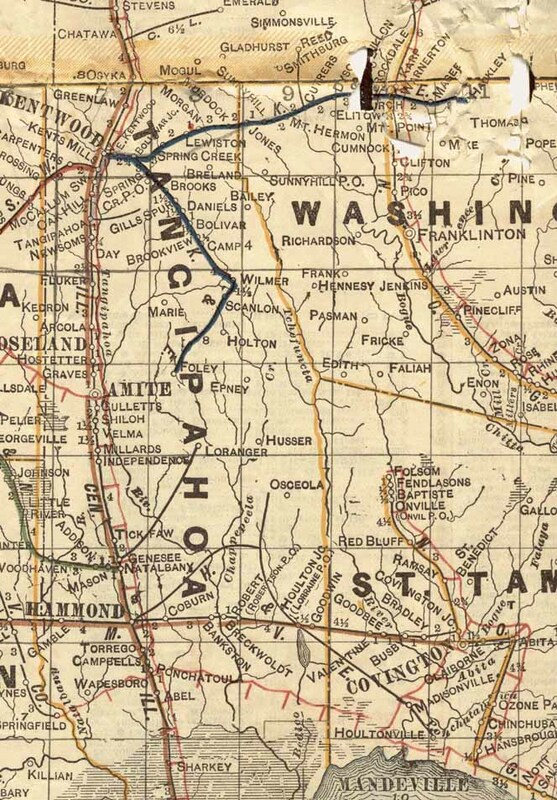 My brother, Brian Hughes, answered the first question by finding maps from 1900, 1906 and 1914 showing Breland located roughly half way between Franklinton and Kentwood. These maps also show Breland’s proximity to Sunny Hill. 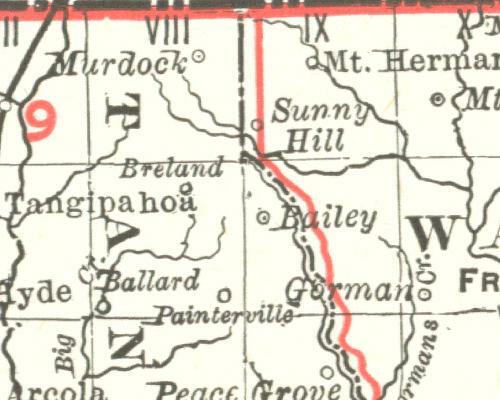 Sibila, shown on this map from the 1840s, later came to be called Breland. Click to enlarge. The place was called “Sibila” before it was called “Breland.” My guess, and this is purely a guess, is that it came to be called “Breland” simply because the first person appointed to be postmaster for the place happened to be named Breland. Does Breland, Louisiana still exist? To the best of my knowledge, it does not. Records indicate that the post office at Breland was discontinued, i.e., closed for good, in 1906. And, although the location of Sunny Hill can still be found via Google Maps, I have not been able to find any mention of Breland, Louisiana, on any current maps of the area. Do you know any additional details about Breland, Louisiana? If so, I’d love to hear from you! FYI: There is a group on Facebook called “Breland Family News” I accidentally joined one time, but most of them were from Louisiana. Perhaps they could have some information. Thanks for letting me know, Jennifer.